Did you know that an estimated 5 million Australians suffer from migraines and approximately 7 million from tension headaches? Chronic headaches are one of the most common complaints made to healthcare practitioners every year. These headache sufferers are looking for some answers and treatment. Headaches are most often treated with over-the-counter or prescription medications. These treatments are only a temporary solution for a chronic problem. Massage therapy has shown to be effective in treating migraine and tension headaches. Migraines are still somewhat mysterious. They are believed to be caused by neck ,misalignment, hormonal changes, vascular problems, neurological problems, food sensitivities, environmental irritants, and/or blood sugar regulation. Migraines are often severe and can last up to several days. These headaches often cause sensitivity to light, sound, and nausea including vomiting and can be debilitating to the sufferer. Tension Headaches can be caused by muscle spasms, trigger points, TMJ (Temporomandibular Joint) dysfunction, neck misalignment, poor health, dehydration, muscle spasms in the neck, shoulders, trapezius as well as other upper postural muscle groups caused by stress, anxiety, injury, sporting injury or any number of other possible causal processes. Tension headaches can show up as a tightness or constricting feeling in the head, as pain in the head or referred pain in the neck, shoulders, and arms, as muscle spasms/pain, as pain in the jaw, or as pain around the temple and behind the eyes. Tension headaches usually do not come with other sensitivities, such as sensitivity to light and sound or nausea. These disorders can be debilitating and typically contribute to high stress levels, time off work, difficulty engaging in normal day to day activities, lack of sleep, reduced enjoyment of life, etc…. So it’s no wonder why so many people want to know how to relieve tension headaches. “Both migraines and tension headaches have been effectively treated by massage therapy. Not only can massage help relieve headache pain, but it can also help to prevent headaches from occurring,” states qualified Gold Coast massage therapist Lauren Tindall. Nobody likes to be in pain, and for people who suffer from migraines, pain can be debilitating, disrupting both their personal and professional lives. Whether migraine hits once in a while or on a regular basis, finding relief – preferably relief that can be counted on – is a top priority. 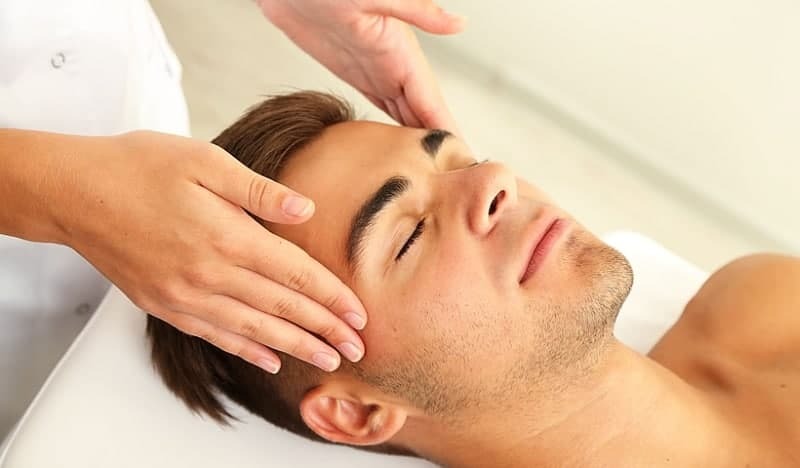 Massage therapy has shown success in helping people who suffer from migraine reduce distressing symptoms, better manage the pain and even lower the frequency and severity of attacks. To help your clients who get migraines, you’ll need to understand the condition and what massage therapy has to offer in terms of pain relief. The purpose of massage therapy is to target the source of the body’s pain by soothing tense muscles, increasing flexibility, and providing relaxation to the affected muscles as well as the body as a whole, thereby calming the mind and emotions. Massage also promotes circulation to the affected or injured muscles, which increases nutrients and oxygen to the damaged tissues. In turn, this increased activity to the affected sites reduces stiffness and edema (swelling) in the muscles and joints, as well as increases flexibility to help reduce pain. Moreover, this form of therapy also releases endorphins (pain-killing hormones), which boost the dopamine and serotonin levels in the body. These hormones assist the body in many ways–physically as well as emotionally. Case in point, they promote healing, pain management, and feelings of euphoria, as well as help to calm the nerves resulting in a reduction of headache/migraine symptoms. When you are given a chance to relax and de-stress through massage treatments, your levels of mental clarity and alertness increase. There is evidence showing that massage for migraine sufferers may help reduce the number of attacks. A randomized, controlled trial of massage therapy as a treatment for migraine. Participants either received no massage or two 30-minute traditional massages for five weeks. Before and after each session, each participant’s heart rate, anxiety level and salivary cortisol were measured. The massage group reported a decrease in the frequency of migraine attacks compared to the control group. Heart rates, anxiety level and salivary cortisol levels also decreased by the end of each massage session. Sharon Van Beek and Karen Brown suffer from chronic migraine headaches. Both women have 15 or more migraine days a month. Only 8 percent of the migraine population have migraines this frequently or this severe – roughly 300,000 people. Van Beek schedules a massage every 4 to 6 weeks to help her manage her migraine attacks. Her massage therapist Lauren Tindall of Holistic Bliss Bodywork on the Gold Coast is trained in remedial, deep tissue, trigger point and lomi lomi massage. Brown, who schedules a massage every two weeks, believes finding the right massage therapist is essential. “It takes a very special, knowledgeable and responsive practitioner for massage therapy to be an effective form of migraine prevention,” she says. She prefers gentle myofascial trigger point massage, noting that anything too rough or hard is often too much to bear and can trigger a migraine attack. A recent study showed that massage therapy recipients had fewer migraines and better sleep quality during the weeks they received massage, and the three weeks following, than did participants that did not receive massage therapy. Another study found that in adults with migraine headaches, massage therapy decreased the occurrence of headaches, sleep disturbances and distress symptoms. It also increased serotonin levels, believed to play an important role in the regulation of mood, sleep and appetite. — S. Roberto Smith, Gold Coast.